Build Team: Arthur Mamou-Mani, Maialen Calleja, Philip Olivier, Eira Mooney, Aaron Porterfield, Antony Dobrzensky, Laura Nica, Karina Pitis, Hamish Macpherson, Jon Goodbun, Yannick Yamanga, Matthew Springer, Joshua NG, Lola Chaine, Dror BenHay, Junbing Jiang, Knaan Kirshenbaum, Charlotte Chambers, Michael DiCarlo, Sandy Kwan, Solomon Ebere, Regan Parrish. 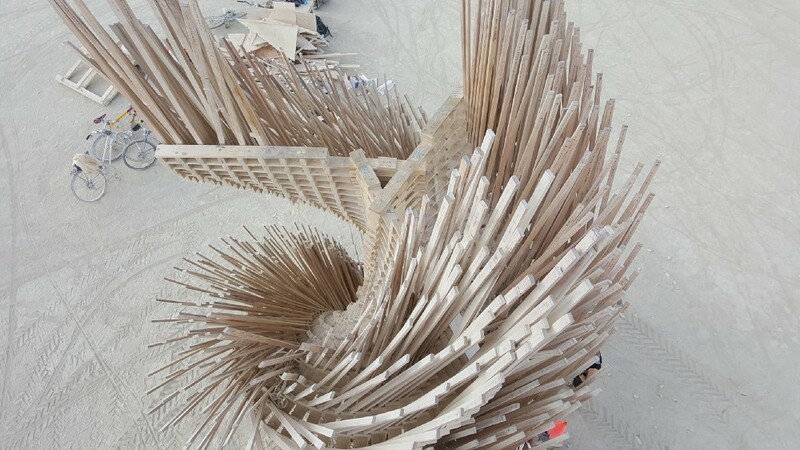 Tangential Dreams is a climbable sinuous tower made from off-the-shelf timber and digitally designed via algorithmic rules. 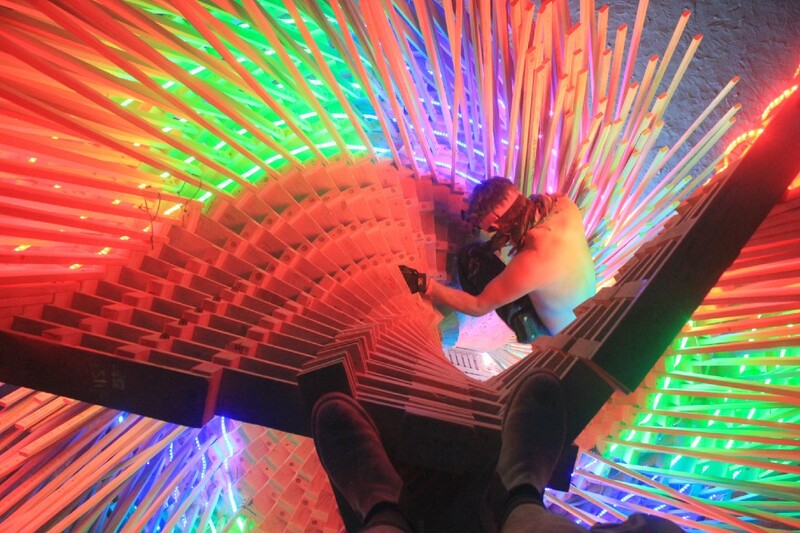 One thousand “tangent” and light wooden pieces, stenciled with inspiring sentences, are strongly held in position by a helicoid sub-structure rotating along a central spine which also forms a safe staircase to climb on. Each one of the poetic branches faces a different angle, based on the tangent vectors of a sweeping sine curve. In line with this year’s theme, the piece is reminiscent of Leonardo’s Vitruvian man’s movement, helicoid inventions such as the “aerial screw” helicopter and Chambord castle helicoid staircase as well as his deep, systematic, understanding of the rules behind form to create art. 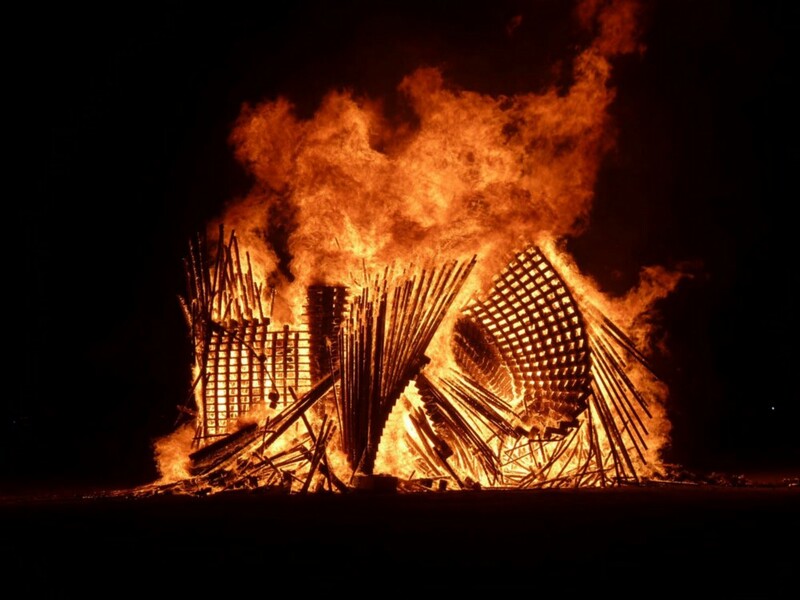 From a wave to a flame all the way to a giant desert cactus, the complex simplicity of the art piece will trigger many interpretations, many dreams. The piece attempts to maximize an inexpensive material by using the output of an algorithm — (the value of the piece being the mathematics behind it, as well as the experience, not the materials being used). The computer outputs information to locate the column, sub-structure and tangents. We believe digital tools in design are giving rise to a new Renaissance, in which highly sophisticated designs, mimicking natural processes by integrating structural and environmental feedback, can be achieved at a very low cost. We worked very closely with our structural engineer format, sharing our algorithms, to give structural integrity to the piece and resist the strong climbing and wind loads. There are now three “legs” to our proposal, each rotated from each other at 60 degrees angles around a central solid spine, to ensure the stability of the piece, similarly to a tripod. The tangents are not just a decoration, they act as a spiky balustrade to prevent people from falling. The central column is made of clusters of 2*4 timber, tapered at a 30 degree angle to form triangular pieces, overlapping and rotating by a fixed increment, holding the helicoid pieces together around a strong central axis, fixed with deep structural wood screws. The helicoid members, made of 2*8 timber, will be held on one side by the column and on the other side by another standard riser piece, also fixed with structural wood screws. The sub-frame will then be used to locate and fix the tangent pieces, made from a thinner and lighter piece of plywood and screwed with washers to the edges of the two closest sub-frame pieces. The whole 6m high sub-structure will be pre-assembled at the Generator in Reno. The first three legs will be grounded with 4 ground anchors each after having placed the decomposed granite. 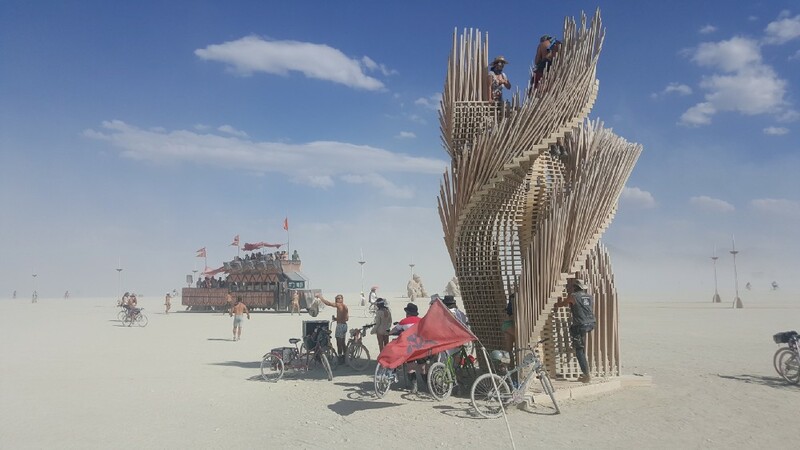 Once the sub-structure is up, the branches will be screwed in place on playa using a scaffolding placed below the spiral. 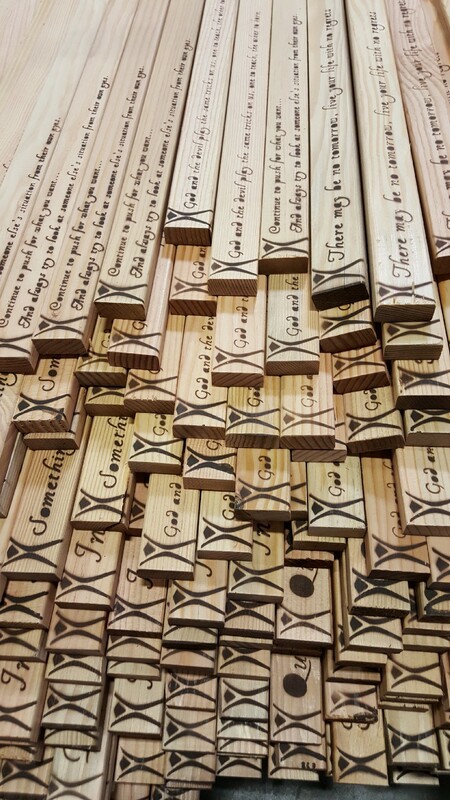 The order of the branch will matter as some of them will be unscrewed and sent to the crowd-funders whilst some of them will be burnt at the end together with the substructure. Plus… the project has grown to be even bigger, keep up with Mamou-Mani to see where it will be built.